A fine and impressive antique George V English sterling silver photograph frame in the Art Nouveau style; an addition to our ornamental silverware collection. This fine antique George V sterling silver photograph frame has a waisted shaped form with a plain rectangular internal window. The surface of this Art Nouveau photo frame is plain and embellished with subtly convex paralleling panels accented with swept conjoining borders. This photograph frame is fitted with a painted wood back and hinged strut, secured with a swivel catch. 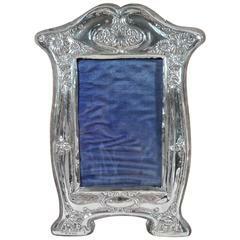 This impressive example of antique silverware is inset with a removable glass panel. Condition: This antique photograph frame is a very good gauge of silver, excellent quality and in excellent condition. The silver frame has been professionally polished and is in presentation condition. Full hallmarks struck to the rim of the frame have wear in keeping with age and location; the lower portion of the maker's mark is worn, but remains legible. Dimensions: Height: 21.6cm/8.5". Width: 16.4cm/6.5". Height: Of interior window 13.8cm/5.4". Width: of interior window 9.5cm/3.7". Depth: 2cm/0.8". Maker: Stewart Dawson & Co Ltd. Origin: Chester, England. Date: 1918. Video: A video of this fine piece is available upon request. Reflections in photographs may detract from the true representation of this large antique photo frame. This antique photograph frame is a very good gauge of silver, excellent quality and in excellent condition. The silver frame has been professionally polished and is in presentation condition. Full hallmarks struck to the rim of the frame have wear. By William B. Kerr & Co.